This is a beer that I've had before, way back before I appreciated what good beer was. At the time I remember thinking that this isn't a beer, now with a more refined palate I'm coming back to try it again! I've also got the glass, which is always nice. 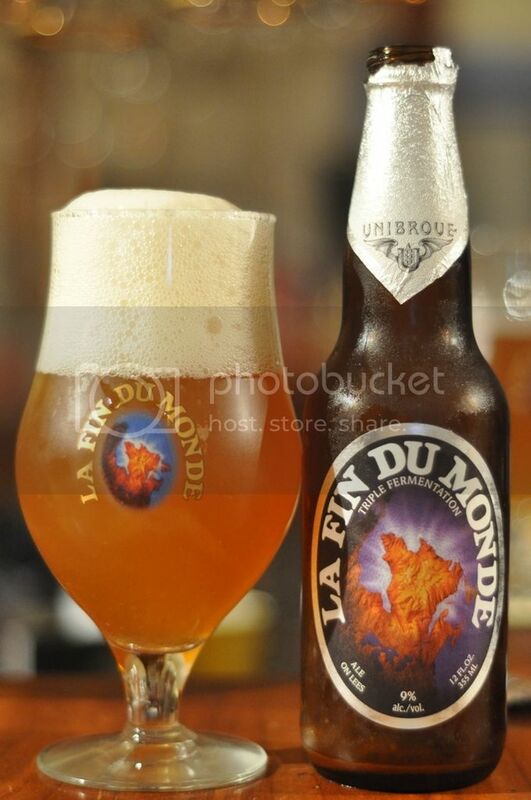 La Fin du Monde is French for 'the end of the world' and is essentially a Belgian tripel. The serving temperature of 14°C took me a little by surprise so it will have to sit on the bar for a while. I should also point out this was a warm-up to some St. Patrick's day shenanigans, so if this review doesn't make a heap of sense that will be why! Hopefully my notes, and memory get us through. The colour of this Canadian tripel is quite different to many of the Belgian tripels I've come across, which are normally much darker. This tripel pours a hazy golden colour with a bubbly white head above it. Some bubbles can be detected rising to this large head, however there are not enough to stop the head dying down to nothing quite quickly. Despite the strange colour, it's a lovely looking beer. Not only does La Fin du Monde look good it also smells like a fruit market, it's absolutely incredible! There are aroma's of apples, pears, peaches, pineapple even grapes and all smell incredibly juicy and fresh. I think there is also some apricot and even an orange peel zestiness to the nose. It finishes with a touch of alcohol and some light spicyness, maybe caused by cloves or something similar. It's a very intense nose, I can't wait to try it! This is one of the most balanced tripels I've ever had, most struggle to balance the sweetness that they often generate. That is where this beer is different not only is there the usual candi sugar and pale malts but there is also bitterness provided by the not only some hops but also some spices and that orange peel I noted on the nose. There is some banana towards the back of the mouth that wasn't evident on the nose, while all the other fruits are present but less vibrant than they smelt. Overall there isn't alot more to say, it's simply sensation! It's probably the most complete tripel I've ever had and it combines a sensational flavour with a fitting slightly sticky mouthfeel. There's a hint of alcohol towards the end, which is the only thing that hurts the drinkability of this one (9% is probably a little high...)! It's a fantastic beer and anything else I try to say is just going to detract from it, if I were you I would go out and get this beer, it's really sensational!